Tired of going it alone? 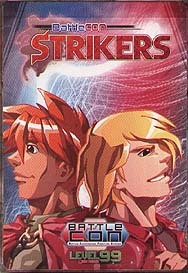 Strikers are here! Add a new element to your fuels by calling in your favourite characters for powerful boosts or unique special moves. Strikers add a dynamic new layer of possibility to BattleCON duels! Strikers give new synergy to Tag Team matches by letting you call your Tag Partner for on-off attacks or assistance when you need it most. Can you build the ultimate team? This box contains 65 Striker cards, covering all the core characters from BattleCON: War and BattleCON: Devastation. It even introduces a few new faces! This is not a Standalone Game. Either BattleCON: War or BattleCon: Devastation is required to play with this expansion.